NANJING, China — Recently I had a revelation while walking through the Guggenheim’s exhibition Contemporary Art of the Middle East and North Africa, where I experienced a unique and familiar kind of dissonance: the broad swath of geopolitically and culturally volatile regions the exhibition claims to encompass is somehow distilled and distanced in a clean, manicured presentation tucked into the side of the institution’s iconic ramps. Not that the curatorial execution wasn’t thoughtful, nor was contextualization missing; the usual repertoire of publications, talks, or reviews often burrow deeper beyond the museum visitors’ attention span or, sometimes, accessibility. But there’s something increasingly odd and deeply disturbing about the categorical operative still implemented in contemporary art insinuations that pride themselves on possessing not only a global perspective but often also a global reach — physically, no less, in the Guggenheim’s case. I am not advocating against cultural specificity, and have taken into account the pragmatics of such curatorial practices (buoyed usually by private money in the designated regions), but it is harder and harder to look at these snow-globed, bikini-waxed samplings of the contemporary art “of” or “from” a particular region (usually a non-Western one, crudely speaking), especially when some kind of social or political urgency is evoked, as if their reality isn’t steadily bleeding into ours while ours oozes right back. One consequence of this categorical thinking is that very rarely is the luxury of context afforded to the artistic practices surveyed in these compact, regionally focused shows; the art has been filtered through ranks of advisories, gallery representation, and safari-like research trips before arriving at the pristine galleries of prominent institutions. By “luxury,” I mean the kind of context that isn’t summed up or crammed into word-count-limited labels, where art is often broadly mapped to — and understood through — major historical or political registers, rather one that has broader and more nuanced resonances in public life and consciousness. The “other” now has a voice but still has to explain, translate, and make sense of itself. It is not surprising, then, to find that self-exoticizing art practices with built-in, bite-size self-explanatory mechanism are still quite prevalent. Paris-based Huang Yongping, one of China’s most formidable conceptual artists, put it quite bluntly when speaking about navigating different cultural realities throughout his career between China and France: “Leveraging the East in the West, and leveraging the West in the East”— seeing right through the robust consumerism of an often uncontested otherness. Another insidious side-effect manifests in the self-legitimizing practice of new, often private cultural institutions in regions experiencing recent cultural booms. China is one prominent case, where private museums and foundations dedicated to contemporary art compete to mount shows full of established names who have been sanctioned by either a particular historical discourse (Warhol, Giacometti), top-tier galleries, or hip(per) New York institutions such as MoMA PS1. There’s nothing wrong with mounting these shows per se, but when recycling brands and trends ad nauseam eclipses meaningful and critical engagement with locally based artistic communities and audience, one can’t help but lament the waste of the resources — ample budget and international visibility — that these institutions have at their disposal. To be fair, independent and nonprofit spaces with an experimental bent have always been numerous and active, but it’s not like they have starchitects to build their spaces or friends like Klaus Biesenbach (who is frequently courted and showed off by private art foundations in China). It is in this context that I find Sifang Museum’s current exhibitionMountain Sites: Views of Laoshan an extraordinary and welcome anomaly. Co-organized by the museum’s founder Lu Xun and its in-house curator Liu Lin, the project solicited new works from 20 emerging and mid-career artists and designers in response to the existing natural, industrial, and architectural structures in the mountainous area where the Steven Holl–designed museum is located. It is worth noting that all the artists in the show are Chinese-speaking, according to the brochure, and the majority are based on the mainland, so even though the concept calls to mind the art island of Naoshima or commissions of land art in Echigo-Tsumari, it doesn’t have an “international” lineup that the Nanjing-based museum could easily have whipped up, given its collection caliber testified to by a park of starchitectures and the likes of Luc Tuymans. Instead, the stance is defiantly local. Of course, locality in Mountain Sites isn’t solely defined by the “sites” or the lingosphere the artists share. It figures more prominently in the registers of experience — aesthetic, temporal, sensorial — that the various pieces constellate. At the Doushuai Temple, which attracts a steady patronage of worshipers and tourists, artists are very much tuned in to the functional parameters of such a site. 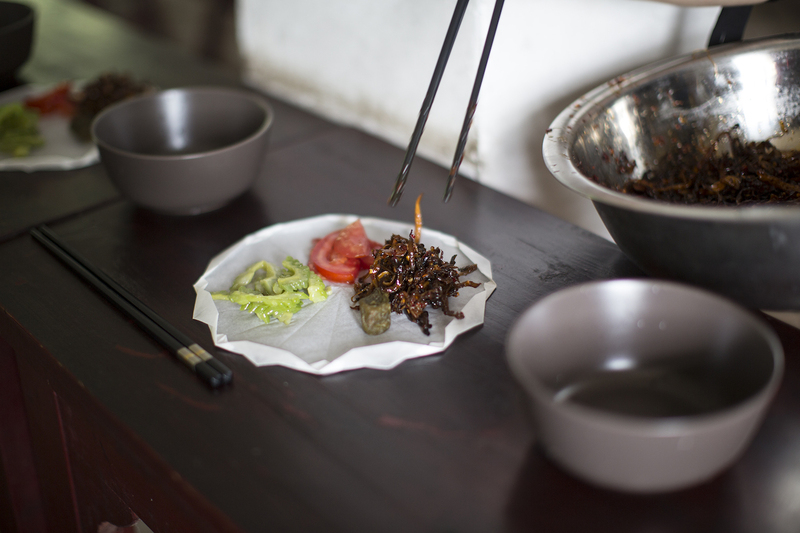 Xie Fan’s “Buddhist Lunch” (2016) provides a tasty meal, abiding by the temple’s dietary regulation with ingredients evoking familiar tropes of life’s four flavors. 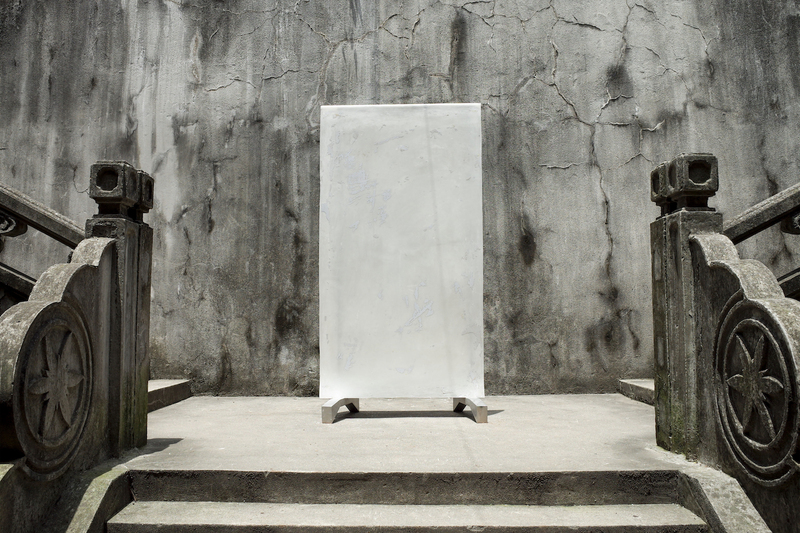 “Mount Sour” (2016), a scattered installation of furniture — benches, stools, tables, and screens — designed by KAIYINSTITUTE, acknowledges the ubiquity of such fixtures in temple complexes and stages a playful yet noncompetitive group of counterparts characterized by material intrigue: beguilingly brittle form and ostensibly industrial materiality, which nevertheless complements the temple’s texture and color scheme thoughtfully, rather than through a cheap shock of jarring contrasts, which so often plagues installations involving elements of the past. 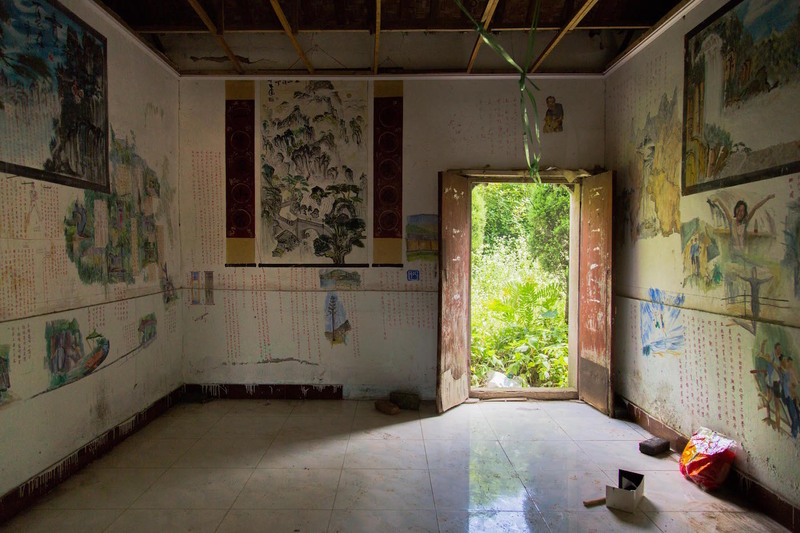 At the nearby White Horse Village, two artists speculated on the afterlife of a tiny abandoned house, formerly a temporary shelter for migrant workers. With “Baima Village Wall Painting Annotations” (2016), Xu Liwei expanded on an existing mural by offering his own comments, annotations, and drawings that continue the narrative — a familiar literati strategy. 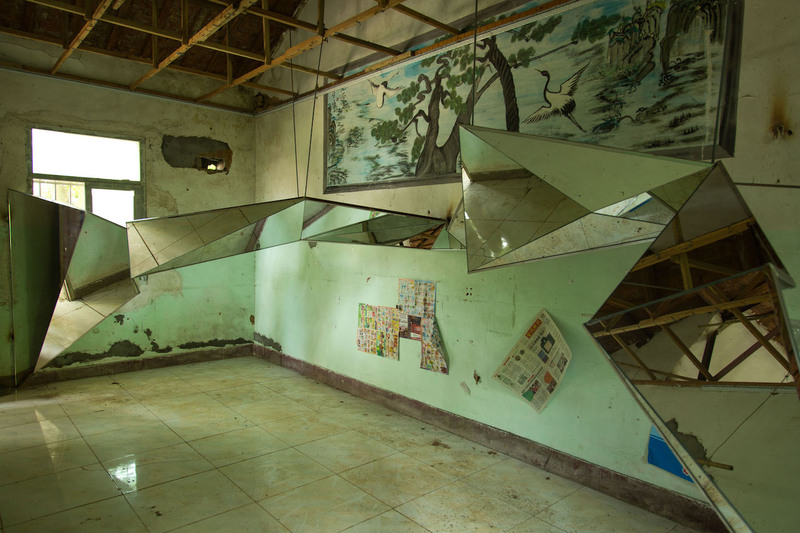 Xue Wenwen transformed an adjacent room — with debris and quotidian objects still scattered about — into a kaleidoscopic mirror installation that fills yet dissects the space, a “Warmhole” (2016) that destabilizes the house’s foreclosed fate. 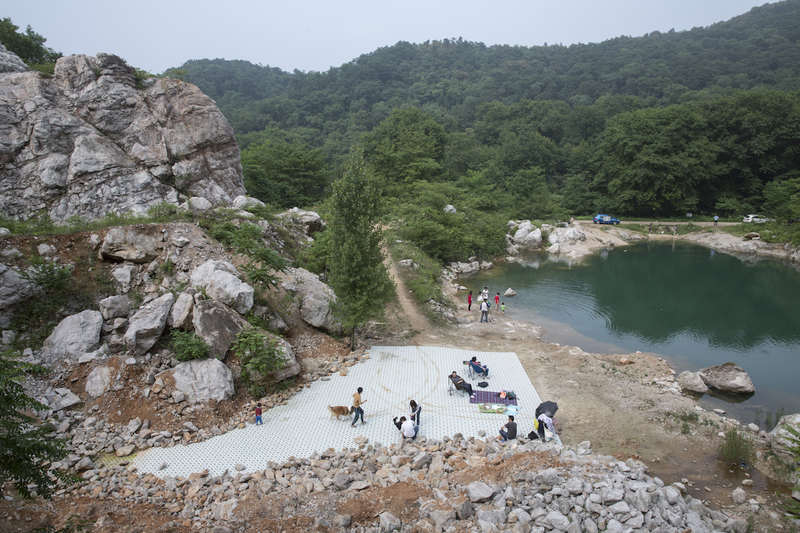 Another kind of alchemy takes place at the abandoned quarries of Laoshan. Zheng Guogu painted an assortment of large, discarded motorized parts in a cheesy gold tone (“Golden Mining Field,” 2016), a gesture that seems to throw shade equally at “installation spectacles” and the pursuit of prosperity, while Oscar Chan Yik Long inscribed a cliff face with totem-meets-graffiti doodles of skulls (“The Lord of the Mountain,” 2016) that smudge the temporality of the site: a testimony of past calamities or a premonition of imminent disaster? The most uncanny sight here is “Natural History 4” (2016) by Wang Wei, who transplanted a sizable floor of mosaics, with patterns inspired by buildings in Dongguang, Guangzhou, into the quarry basin. The rest of the site is untouched, giving the disorienting illusion of an endless mosaic carpet wedging farther under the surrounding mountain ranges, or a side façade of a modern building surfacing from a future archeological dig. It’s a gorgeous and unsettling scene that leaves spectators in suspense, falling down their own imaginative rabbit holes. Things are not contained either at the Sifang Museum, itself a topographically intriguing structure that flirts with parallel and linear perspectives. 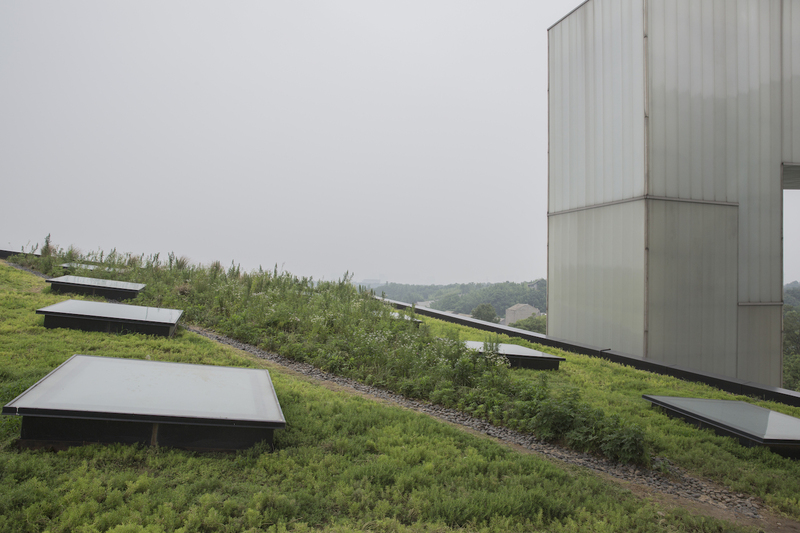 Zheng Bo brought to the roof garden an extensive sampling of local mountain weeds as a permanent and living archive (“Weed Plot,” 2016), while Lu Pingyuan’s “Runaway Tale” (2016), a suspense story written by the artist, lures visitors right back to the wilderness: Part of the story is inscribed on a brick at the museum’s entrance, the rest carved on a boat moored in a nearby lake. Liu Wei’s “Dark Matter” (2016) — black billboards of various geometric shapes — dot the road to the museum; on an adjacent slope, Zhao Yao erected a dual-axis solar tracker with panels covered in a specific paint called Cosmos Black from Mercedes automobiles (“Cosmos Black Is Spinning Around,” 2016). Videos and installations within the museum mediate other encounters and resonances. Some even offer itineraries: Designer Li Weiyi provides a digital map of Mountain Sites so that visitors can develop personalized travel plans or mess with those of others. 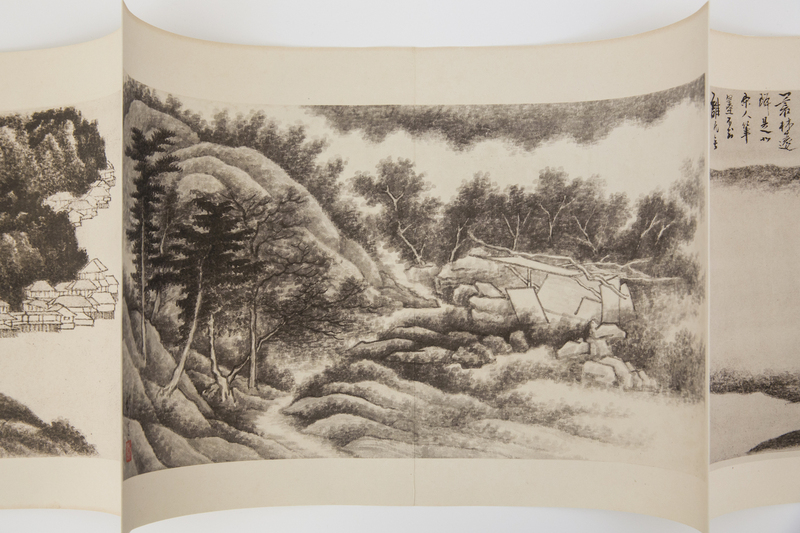 With “Gong Bangian Four Hundred and Seventeen” (2016), young yet virtuoso ink painter Hao Liang presents an album of landscapes in the style of Gong Xian (an artist active more than 400 years ago), as if he had somehow survived half a millennium and decided to go sightseeing in the area. Guan Jun transformed the museum’s entire upper level into an itinerant installation of drawings, photography, and melting ice (“Hua,” 2016) that layers the museum’s morphology onto the conceptual topography of a mountain. Two temporary/limited-run performances were particularly effective in manipulating not only place, but also time. The sight of artist Yu Ji hoisted up a tree and laboring on a delicate, golden web made from pine resin over the course of a few hours (“Etudes-Lento,” 2016) felt like witnessing an experience congealed and sealed into amber. 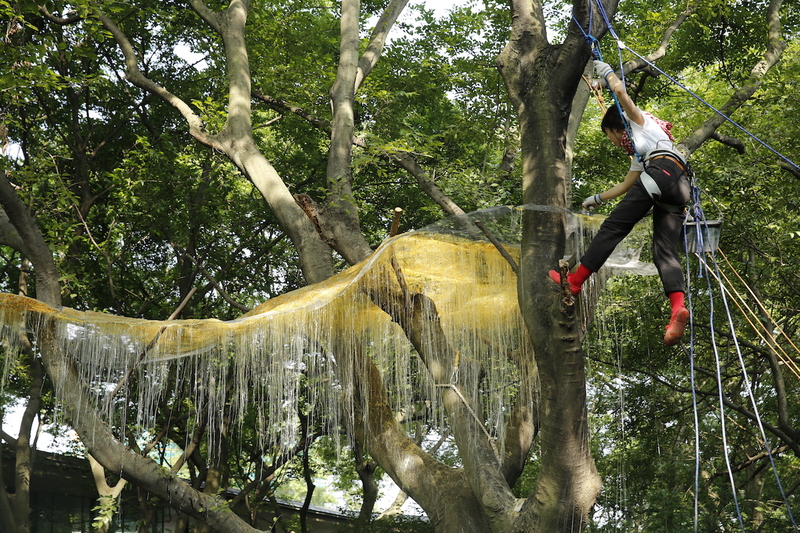 Tang Dixin’s “Shooting the Moon” (2016) led visitors on a two-hour excursion through thick forests and slippery slopes — a path created and marked by the artist himself — only to capture intermittent chants or catch a glimpse of Dixin paddling away on the lake using, impressively, only two long bamboo poles. Mountain Sites is a merry chase of an exhibition that remains tuned in to the presence and the (often anachronistic) contemporaneity of its locality. Even the works’ Chinese titles read comfortably Chinese, rather than some obscure cousin of International Art English. A hidden context or assumption here, perhaps, is that despite what we know of Land Art or installation parks, mountains in China have never been untouched, national park–type entities. They are always studded with architectural interventions, inscribed with religious or commemorative texts, and charted in written and painted accounts — compilation of natural and cultural histories. And yet these pleasures of navigation are never in conflict with the appreciation of natural topography. While this isn’t a context that explains the show, it is certainly one that places it in a comfortable yet meaningful dialogue with multiple discourses, and one that instrumentalizes both the artists and their audience. Mountain Sites continues at Sifang Museum (No.9 Zhenqi Road, Pukou District, Nanjing Jiangsu P.R., China) indefinitely — until the works dissolve.